Penzijní fond Komerční banky a.s. was formed on 27 July 1994 by Komerční banka, a.s., as a public limited company providing retirement benefit schemes with governmental contributions in accordance with Act no. 42/1994 on Supplementary Pension Insurance with Governmental Contributions [i.e., government-subsidised non-state pension schemes]. Over the time of its existence, PFKB has become one of the leading and most stable pension funds in the Czech market. PFKB effectively manages its clients’ funds while focusing on a long-term stable growth in the scheme members’ savings and managing its own costs. PFKB is one of the founding members of the Association of Pension Funds in the Czech Republic. 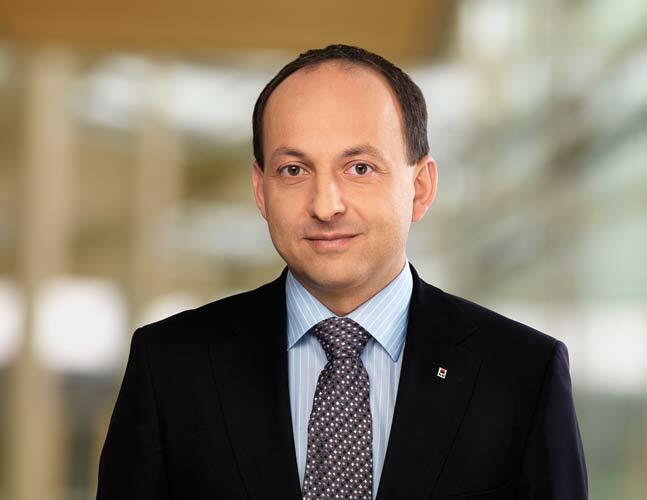 The only shareholder of PFKB is Komerční banka, a.s. PF KB has never merged with any other pension fund throughout its history. At the end of June 2001, Société Générale became the majority owner of Komerční banka, a.s.
PFKB’s share capital is CZK 200 million (exchange rate approx. CZK 25/EUR). The reserve fund and other capital funds currently exceed CZK 345 million. The number of scheme members and the volume of assets under management have been gradually increasing since 1995. 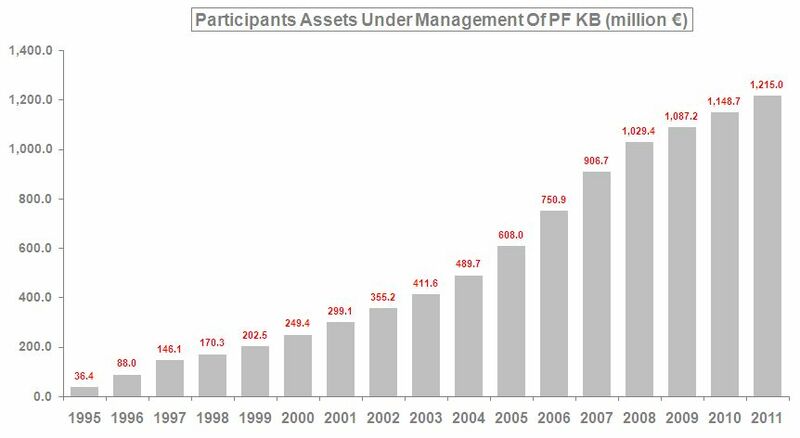 At the end of 2011, there were 507,626 scheme members and CZK 30.4bn of members’ assets under management in PFKB (please see the development of both figures in the enclosed graphs). Investiční kapitálová společnost KB, a.s. (IKS KB) has been PFKB’s assets manager since the beginning. IKS KB became a subsidiary of AMUNDI, one of the leading asset management groups in Europe, in 2010. Our excellent results have been also recognised by the international media. Not only by Global Banking and Finance Review, even by World Finance magazine. PFKB was awarded by them as the Best Pension Fund in Czech Republic for 2011. Given the local regulatory constrains, the pension fund’s investment strategy is very conservative. The goal of the investment strategy is to provide a secure and stable source of income for scheme members while meeting the statutory objective of yearly positive returns, coverage of the pension fund’s liabilities to the scheme members at the nominal value at all times, and a sufficient level of capital. PFKB mainly invests in low-risk government bonds, investment grade corporate bonds and term deposits. We mostly apply passive management to our portfolio. A minor part of our portfolio is managed actively. Despite the regulatory constrains and financial crisis in 2007 and 2008, we managed to achieve positive returns in those difficult years. We also achieved a positive return in 2011 despite the recently escalated European debt crisis with its significant negative impacts on financial markets. Concerning liquidity: its risk determines the ability to cover all withdrawals from the fund and models liabilities for the short and long term. ALM comprises a whole set of perspectives on the maturity profile of assets and liabilities. It uses a stress scenario of a 30% increase in deposit withdrawals as a model of liabilities and evaluates the maturities of assets accordingly. Credit risk; management consists of procedures for approving counter party exposure and evaluating portfolio diversification. A default in any counterparty should not decrease the fund’s annual return below an acceptable level. For measuring market risk, we use standard Value-at-Risk, sensitivity and stress testing to evaluate the downside effect of various historical and hypothetical market scenarios on both the individual and the portfolio levels. Since the fund’s portfolio is mostly fixed-income, the single most important element of market risk is the interest rate risk. FX risk is hedged completely. As mentioned above, the investment strategy and asset allocation are mainly determined by the strict regulation and by the accounting rules applied just to pension funds. Based on regulatory constrains and our experience with limited (up to 5% of our portfolio in the period from 2007 to 2009) investment in European and US stock funds, at the beginning of 2010 we decided to stop our investment in stocks or stock funds, and investments have since been dedicated only to fixed-income assets. Currently we are preparing PFKB for its transformation into ‘KB Pension Company’ in accordance with the pension reform laws (to come into effect in 2013). KB Pension Company will provide both non-state pension schemes in what is referred to as ‘the second pillar of the pension system’ and non-state pension schemes [“supplementary pension insurance”] in the third pillar of the Czech pension system. However, the preparations for the pension reform are running not only in PFKB but in the whole of the KB Financial Group, which will continue to provide its clients with comprehensive solutions for their financial needs in the area of long-term savings and provisions for retirement, where savings for retirement are only a part of the comprehensive financial puzzle delivering the right mix of yield, risk and liquidity to clients.